Buying a wood router is one of the most important first steps taken by most amateur woodworkers who are starting to get more serious. It makes many things possible that aren't when working freehand. A fully dedicated router table will make or break many types of woodworking, including forming the ends of wooden bits and planing flawless grooves and edges into planks. What should I be looking for in a router table? It is very important to note what size table you are looking for. While this can seem to be a simple thing to keep tabs on, it should be compared to the scope of the work. Smaller router tables might be more portable, but are not ideal for larger pieces. It would be problematic to need to fall back to freehand router usage. You are going to need a solid fence, which will provide you with an advantage with a surface to push the router bits against. Smaller router tables may be more mobile, but they are not ideal for larger pieces. A lower quality fence might end up with you needing to go freehand. You might find yourself exerting a good bit of force onto your workpiece at several points in the process. If your chosen router table is not stable enough to handle this added pressure, you run the risk of tipping your table and causing permanent damage. For these reasons, it is important to ensure that the legs of the table and the work surface have the strength to handle any level of pressure you may put on it. While not essential, it is nice to have a solid dust collection mechanism for your router table. Routers move a good bit of wood and create a ton of dust, shavings, and debris. This can lead to harmful sawdust in large quantities, that is not only hazardous to health, but also poses a massive fire risk. Also not completely necessary or essential, but most router tables provide some kind of under storage. This is extremely beneficial, as sometimes work requires several bits to be utilized to properly finish a piece. Additionally, this can save shelving space if a workspace is lacking in the free space department. With the above in your mind, three major router table types exist that need to be compared and contrasted to be certain you are getting the best bang for your buck based on your needs: bench router tables, free-standing tables, and router table extensions for table saws. 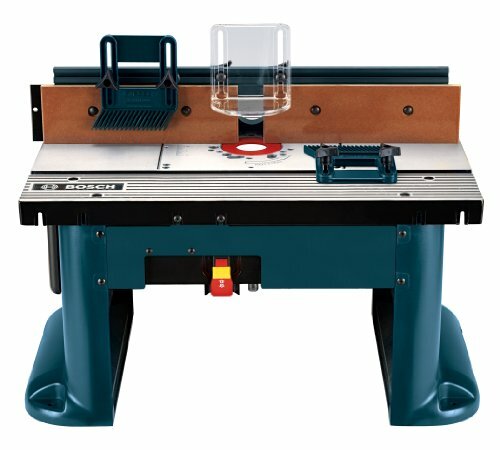 Bench top router tables are the popular option for amateur woodworkers. These tables are the perfect size to put onto a bench top for effortless usage. They take up far less space and are typically incredibly mobile. Typically on the smaller side, a woodworker who plays with larger wood pieces frequently might want to select a different choice, as it might make some tasks obsolete or unworkable due to its smaller size. Free-standing router tables work exactly like you’d think. These tables lift up the piece being worked on to a good height without needing a seat or stable platform for placement. These tables are better for professional woodworkers and those working with larger pieces. Additionally, there are extensions for router tables, which are added to already existing table saws. These are usually higher in quality and are terrific alternatives for those limited in space. They are easily removed and stored somewhere that does not take up as much precious floor space. So what router table option is best for my situation? The answer to this question is wholly dependent on what you want to accomplish with your router table. Free standing tables are almost always the preferred option. However, they may not always be ideal for those with space constraints. If you are a woodworking pro, or find yourself working in shop-like settings, a free-standing router table with all necessary accessories is very much what you should be looking at. For amateur-level woodworkers slowly transitioning into more serious projects, benchtop routers are an option. These handy and mobile additions to workshops include a good bit of flexibility into what can be done with the routers. The space they use is a fair price to pay for the excellent quantity of work you can accomplish. For more serious hobby woodworkers, extension tables for routers are a wonderful idea. They are more difficult to set up than alternatives, but their ability to simply attach to your current table saw is a ridiculous bonus. They're also helpful in wood shop situations, because you may cut and route the timber you end up working on immediately. Bosch’s RA1181 router table is perhaps the strongest portable table per dollar spent. It is going to accept any Bosch or DeWalt router, or pretty much any other router you have sitting around. It is best suited to Bosch branded products, but do not be discouraged if there is a different brand in your shop, since you can fit virtually anything. This is truly the universal router owner’s best friend. 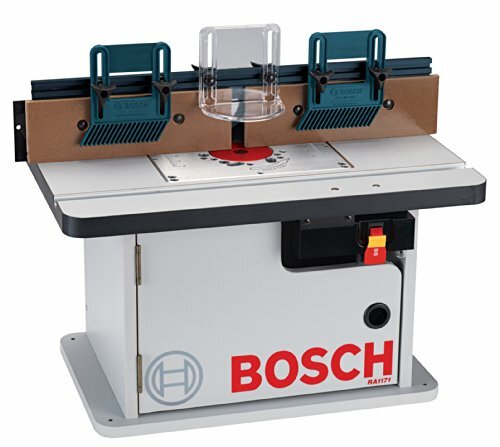 Whether you are designing a wooden frame, or working towards a niche hobby such as guitar construction, the Bosch option router table is a strong addition to any workshop. There is a real reason why the Bosch router is one of the top rated router tables on the market. This includes a cabinet layout, making the router surface somewhat less stable compared to something with great, sturdy legs such as the Bosch RA1181. It's not unsteady but it's not ideal for very heavy projects. The biggest problem here is that it simply is not as durable as its rivals. You'll get years from it, but someone using it for hours a day should look elsewhere. The main draw here? Price. The RA1171 comes in significantly under its competitors, and it's a cheap price to pay for the use you will get from it. It's perfectly acceptable for cabinet making or any other small to medium sized task you put your mind to. For the woodworker on a budget, this is the one to purchase. 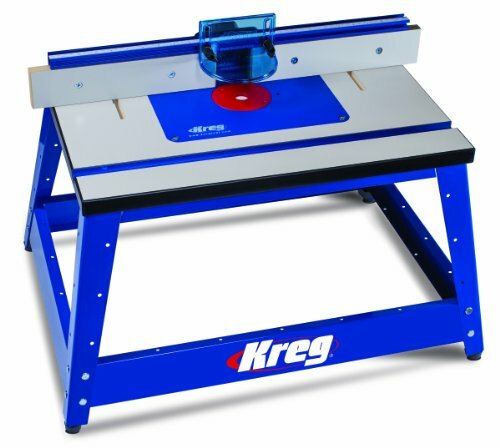 The Kreg PRS2100 is most likely the best little router table you will find anywhere. It's guaranteed to fit into all but the tiniest budgets also. It's the least expensive option on this list; but that is for good reason. They did not skimp on the materials here. The stand is made from high-quality steel, meaning there is pretty much no fear of structural weakness here. The paint should also keep unsightly rust away from the table for a very long time to come. Additionally, it includes a set of high quality levels that will be certain that you have the perfect angle when you mount your router. If you are mounted level, you are certain to make the cleanest, most precise cuts (particularly valuable for joinery).